The number of blockbuster monoclonal antibody (MAb) drugs continues to grow. In 2008, MAbs generated revenues in excess of US$15 billion (1), making them the highest-earning category of all biotherapeutics. The world MAb market will reach $62.3 billion in 2015, with next-generation therapeutic antibody revenues reaching $2.3 billion in 2015 according to Visiongain reports published in September and November 2011 (2, 3). Biosimilar antibodies will also begin to enter established markets as regulatory authorities clear approval pathways for them. Most antibody drugs treat cancer and autoimmune diseases, and many of the rest are used to treat orphan and infectious diseases. Unfortunately, antibodies are complex proteins in many ways, which complicates their purification and characterization, making it difficult for their developers to meet the rigid requirements for therapeutics. Because of the inherent and engineered variations in therapeutic antibody structures, there is no “one-size-fits-all” when it comes to techniques for MAb purification. The closest anything has come to this is evidenced by the success of protein A affinity chromatography, which has become the workhorse for antibody production. However, protein A is expensive (with costs an order of magnitude over conventional chromatography resins), susceptible to degradation by proteases (cleaved domains can adhere to a MAb product, complicating separations) (4), and not fully stable to column washing and elution conditions. It can generate an immunomodulation response and has limited capacity to accommodate the increasingly high titers found in modern upstream feeds. Although the antibody purification field is advanced, among companies involved there has been some reluctance to invest in and introduce new technologies and/or further advance purification technologies. Some articles have referred to new alternatives as “disruptive” (5) while predicting that protein A will continue to be used for commercial-scale MAb purification throughout the foreseeable future (5, 6). But the industry needs to lower production costs and pass along those savings by making medications more affordable for patients. The emergence of biosimilars (or follow-on biologics) and a growing number of companies seeking to capitalize on such products may create a perfect climate to facilitate innovation in purification (7). Protein A is a 42-kDa protein anchored in the cell wall of Staphylococcus aureus(8) with the ability to selectively interact with immunoglobulins (IgGs) (9). It binds strongly to all classes of human IgGs except for IgG3(9). Full-length protein A consists of five homologous domains (referred to as E, D, A, B, and C, in order of their arrangement from the N-terminus) and one cell-wall– associated domain (10, 11). At first, protein A was produced by culturing the Cowan strain of S. aureus and extracting the protein from the bacterial cell walls (12). Later, a strain of S. aureus was discovered that secreted protein A into its culture supernatant (13). As recombinant DNA technology advanced, protein A could be expressed as a fragment without its cell-wall domain using Escherichia coli as an expression host (14,15,16,17). IgG binds to protein A at its Fc region (18, 19). The interaction is very specific and hydrophobic in nature. It involves some hydrogen bonds and two salt bridges. The high specificity enables protein A affinity chromatography to remove >98% of impurities from complex solutions such as cell harvest media in a single purification step (20). One drawback of the well-known specificity of protein A’s interaction with IgGs is that it usually necessitates the use of harsh conditions such as low pH for elution. That can be problematic for some antibodies that are either unstable or tend to aggregate at low pH levels. In general, only a small amount of impurities — e.g., aggregates, residual host-cell proteins, DNA, and leached protein A — will remain after this single starting unit of downstream process operation. They usually can be removed in either one or two additional chromatography steps. Affinity Supports: Protein A has been immobilized to all supports suited for liquid chromatography of proteins (21). Initially, the most popular product was protein A immobilized on CNBr-activated Sepharose CL 4B from Amersham (now GE Healthcare) in Sweden. The medium exhibited high selectivity and low nonspecific adsorption, but due to the nature of the agarose-based support, a packed bed would be too soft to allow for high flow rates. So that medium has been largely replaced by more highly cross-linked Sepharose for large-scale applications. Modern protein A sorbents are based on controlled porous glass, coated porous polymer gel-filled mineral materials, and other supports (22). Such materials are rigid enough to allow for column operation at high flow rates. Table 1 lists some of these products. State of the Art: Since the first reports over 40 years ago involving use of immobilized protein A for affinity purification of antibodies (23, 24), it has become the industrial standard for purification of clinical-grade MAbs (25). Janssen Biotech’s Muronomab (brand-name Orthoclone OKT3) is a CD3-specific MAb that was approved by the US Food and Drug Administration (FDA) in 1986 (26) for use in treatment of acute transplant rejection. It was the first approved product made using protein A as a capture step in its manufacturing process. That serves as the key volume-reduction step in antibody downstream processing. The purification scheme for protein A chromatography is simple: Bind at neutral pH and elute at acidic pH. Method development is easy, which is probably the main reason why protein A affinity chromatography has been universally adopted in large-scale manufacturing processes. Its almost universal applicability and the overall scheme of associated operating conditions lend themselves readily to a platform format (6). on the DBC and used mathematic models to evaluate process robustness and volumetric productivity. You can divide protein A resins into those suitable for preparative scale and those that are not. Rated by DBC, the top four brands are MabSelect Xtra and MabSelect SuRe LX (higher ligand density) from GE Healthcare (31), Prosep Ultra Plus (which does not allow for cleaning with sodium hydroxide, NaOH) from EMD/Merck Millipore, and Poros MabCaptureA (which allows only 0.1N NaOH) from Life Technologies. The capacity of protein A resins at a residence time of three minutes ranges from 30 to 45 mg/mL. LX gives MabSelect a 20–40% increase in capacity over what SuRE media can offer, but only at residence times of six minutes or longer. Such long residence times would extend the length of this unit operation and adversely affect cost. Efficiencies: To address some pitfalls and limitations of protein A affinity resins, some vendors have made efforts to improve them. Most efforts have applied recombinant DNA techniques to increase the ligand’s tolerance to cleaning with NaOH, lower its binding affinity to enable milder elution conditions, and allow chemoselective-oriented immobilization to the base matrix through stable linkage chemistries (5, 32). For example, the SuRe resin was developed to withstand stronger alkaline conditions. Using protein-engineering techniques, a number of asparagine residues (the most alkali-sensitive amino acids, making proteins prone to deamidation) were replaced in the Z domain (a functional analog and energy-minimized version of the B domain) of protein A, and a new ligand was created as a tetramer of four identical modified Z domains (29). Under the MabSelect brand, a recombinant protein A was engineered to include a C-terminal cysteine so it would allow oriented coupling by means of a thioether linkage through a stable 12-atom epoxide spacer arm to the base matrix. That ensures very low ligand leakage, and the selective orientation provides for a higher DBC. The Xtra version has the same backbone as the MabSelect brand, but its wider pores further increase binding capacity. Because protein A is expensive, most manufacturing processes run it in a smaller column for several cycles to purify a single batch rather than using a large column in a single cycle. Cycling increases total purification time and thereby decreases production rate. Antibody expression titers average 8–10 g/L and continue to increase. With current protein A capacities, processing times can be very long and throughputs very low. It is easy to see how a protein A resin with a DBC ≥50 g/L even at higher flow rates (lower residence times) is needed to accommodate such expression levels and improve operations. That would be very welcome, but how can it be achieved? Some options for next-generation adsorbent development could include higher ligand density (e.g., Sure LX brand), alternative ligand orientation and accessibility, bead and pore size changes, and modified support matrices with increased size and potential mass transfer (6). The theoretical limit for protein A in an agarose support is 70 g/L, which may have been overestimated based on some simplistic assumptions (6). However, current reported capacities do show room for improvement. Economics: Cost is another very important factor. Some protein A resins cost as much as $15,000/L. Even with larger numbers of players and competition as time has gone by, prices continue to be quite high, although Repligen resins cost about $6,000/L (but they will tolerate only 0.1N NaOH). Some people argue that protein A’s main limitation is capacity or productivity rather than cost (7) and that capacity issues come from using porous particles in a fixed bed. Protein A itself occupies a large amount of intrapore space in porous media because of its size. A recent and possibly revolutionary approach to increasing protein A capacity was developed by Polybatics Ltd. in New Zealand (33). The company developed protein-A–based ligands that are already cross-linked to polyester beads. E. coli has been successfully engineered to manufacture those beads displaying multiple copies of the antibody-binding Z domain derived from protein A (PolyBind–Z beads). This technology harnesses a natural polyester storage granule formation process inside the bacteria for production of ligand-coated polyester beads. The specific IgG binding functionality of PolyBind–Z beads is 100 mg per gram of drained beads. That represents at least a doubling of the published binding capacities for most commercial protein A resins. Homogenous functional orientation of the ligand and elimination of the need for cross-linker removal represent further advantages of this new polyester bead-based technology. For commercial-scale applications, the company has investigated use of its beads in a cross-flow filtration system and obtained promising results. Polybatics proposed that these beads could be used as a disposable resin to reduce the overall cost of downstream processing for antibodies. It is not clear whether the capacity would remain that high if the beads were attached to a support. Other issues to be addressed are availability of the beads as good manufacturing practice GMP)-compliant material and the potential for excessive compression when they are packed in a column. But these beads could be ideal for processing systems without packed beds (e.g., using fluidized beds or continuous countercurrent tangential chromatography). Some very good reviews have been published on the matter of alternatives to protein A capture (5, 7, 32). Those alternatives come in nonchromatographic and chromatographic forms. Chromatography is often portrayed as a “necessary evil” of downstream processing due to its associated costs, batch operations, throughput, and complexity of scale-up. So nonchromatographic separation techniques for antibody purification are becoming attractive to many developers. The pharmaceutical industry is looking back now to methods that have been used for some time in the nutraceutical and enzyme industries: e.g., precipitation, crystallization, and aqueous two-phase systems (ATPS). Although none of those methods is especially amenable to platform use, they are under consideration because of their relative affordability and scalability. And they could offer benefits in capital avoidance. MAb crystallization early in downstream processing would be very difficult. Impurity levels are high in clarified harvest, and scalability of crystallization processes can be problematic. Even at small scales, such a process would be difficult because antibodies are large and glycosylated, and MAb molecules have a high degree of structural flexibility. PEG Precipitation: Precipitation with polyethylene glycol (PEG) can serve as a concentration step. Such a step can be designed either to precipitate antibody and leave impurities in the media (34, 35) or to precipitate the impurities and leave the antibody in solution (36). In the first case, precipitated antibody can be resuspended in a buffer of choice to be ready for a subsequent unit operation (without diafiltration or dilution). Removing supernatant by microfiltration or dead-end filtration then eliminates the need of bulky, expensive hardware for centrifugation. It also allows for washing the precipitated antibody, which further increases its purity. s would need to be developed and implemented. Some other reagents used for precipitation are ammonium sulfate and caprylic (octanoic) acid. ATPSs are formed by mixing a polymer (usually PEG) and a salt (e.g., phosphate, sulphate, or citrate), or two polymers, with water. These systems can be effectively used for separation and purification of proteins. The two-phase technique has been applied to antibodies that tend to transfer spontaneously from aqueous formulations into more hydrophobic PEG-rich solutions (37). Advantages of this separation method include the potential for relatively easy scale-up and continuous operation, ease of process integration, low toxicity of the phase-forming chemicals, and biocompatibility. Some ATPS issues that remain unresolved are performance variation among different antibodies and system capabilities in relation to virus and DNA reduction. It remains to be seen which intermediate and final purification steps would follow to deliver a product of high-enough quality. In March of 2013, BPI conducted an informal, self-select survey of about a hundred industry participants in the United States, Canada, and Europe. We asked them a few questions about some industry, regulatory, and cultural trends related to protein A and its competitors. Other Chromatographic Methods: A significant amount of effort has gone into further developing one type of fluidized chromatography technique known as expanded-bed absorption (EBA). It involves the use of adsorbent particles dispersed in a liquid media. One main benefit of EBA is a reduction in the number of steps required for antibody recovery due to direct capture of product from a cell suspension. For antibodies, however, this application could not replace protein A, which in a form bonded to agarose is used to capture the antibody in EBA. The first generation of EBA adsorbers was plagued with technical problems. A second-generation version (38) has addressed some of those issues by development of high-density adsorbents coupled with improved column designs. Heavier particles have been synthesized by encasing a dense tungsten-carbide core with cross-linked agarose. Those particles are retained in a column by their own weight, even at the high flow rates required for commercial processing. The capacity of settled particles is low compared with traditional protein A packed resins, but that limitation is compensated for by eliminating the need for clarification. In our March 2013 survey, we asked about a hundred industry participants a few questions about the benefits and liabilities of protein A and its competitors. Clearly it is a subject of much debate, as evidenced by a healthy representation in our results of both very positive and very negative outlooks. Assessing the Benefits: In order of importance (and based on percentages of responses for each), participants ranked the benefits of protein A as follows. Assessing the Drawbacks: In order of importance, participants ranked material cost as the main drawback of protein A, far and above other concerns such as capacity limitations, availability, immunotoxicity, low productivity, multiple cycling, and validation costs. As expected, lower cost ranked a clear first among features a candidate would need to demonstrate for replacing protein A. Other important features were equivalent (or broader) applicability and higher capacity, productivity, recovery, and purity — all ranked as “very important” alongside compatibility with existing facilities and a capability of producing highly concentrated IgGs. Single-cycle, single-shift batch processing was deemed “somewhat important,” as were a familiar operating format and well-established vendor, single-use capability, similar or greater ease of use, and less toxic leachables. Why Does It Persist? Survey respondents listed competition among protein A vendors and increasing development of biosimilars almost equally as trends allowing for the persistance of protein A in the bioprocess arena. Coming in a close third place was a trend among regulators toward more stringent purity requirements (e.g., lower cell host protein, aggregates, DNA, virus). Supporting Data: Respondents most want to see a clear description of method development variables and ranges, along with a clear explanation of the fractionation method, for any potential replacment of protein A. They would also look for detailed examples, including results with similar products, and expect to see those published in a peer-reviewed format. The most likely candidates for success were bioaffinity chromatography using protein A analogues and synthetic protein A analogues (e.g., multimodal ligands). Less likely winners (in order of preference) included cation-exchange chromatography, aqueous two-phase separations, and precipitation methods. What Happens Next? 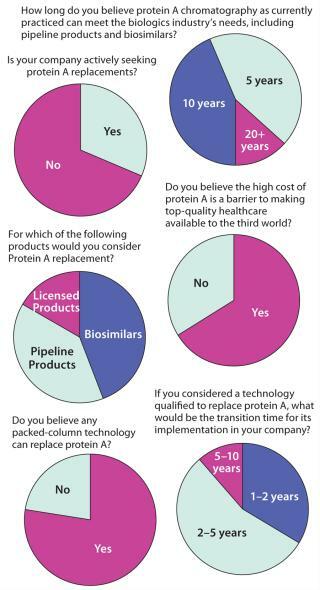 If a highly superior replacement emerged, most respondents (53.8%) believe that protein A might be phased out as a manufacturing method within 10 years. A skeptical third (30%) thought it would persist as a manufacturing method indefinitely, and about half as many were optimistic enough to say that it could get phased out completely within five years. Simulated moving-bed (SMB) chromatography is a continuous, multicolumn system that increases throughput while reducing chromatography bed volume and buffer consumption (39). Some regulatory issues still must be addressed — e.g., in-process documentation, pooling, and batch definition — and it could be difficult to validate and maintain aseptic SMB operations. To a certain extent, it could be applicable to current manufacturing processes in which, to economize the high cost of protein A, companies pack smaller columns and cycle them multiple times to process a single batch. In most SMB examples, protein A is still the preferred method for antibody capture. And in a recent BPI industry survey (see the “Survey Says” boxes for more detail), this technology ranked above fluidized bed and monolith options as the most likely to significantly improve or prolong the performance of protein A.
ent tangential chromatography (CCTC), as reported by Shinkazh et al. (41). They pumped slurries of porous particle media through a series of static mixers and tangential-flow membrane modules to separate a model protein mixture containing bovine serum albumin and myoglobin using a commercially available anion-exchange resin. Membrane adsorbers (“membrane chromatography”) offer clear advantages over conventional resins, both in terms of disposability (which eliminates the need for cleaning and validation) and the ability to operate at high flow rates. Because of their lower surface area, however, most membrane adsorbers suffer from low binding capacity compared with an equivalent volume of porous particles. An exception to that limitation is membrane technology developed by Natrix Bioseparations (35). The company’s membranes consist of a polymeric hydrogel formed within a flexible porous support matrix. That macroporous hydrogel polymer structure provides high binding-site density and a large surface area for binding and rapid mass transfer. Kuczweski et al. developed a membrane-based, high-capacity, cation-exchange capture step for MAbs using a C membrane from Natrix. They reported a capacity of 55 mg of antibody per milliliter of membrane, which is about five times that of other membrane adsorbers (35). Because of low capacities and dilutions created by the void volume and variations in membrane thickness, most of these adsorbers are preferentially used in flow-through mode. In our March 2013 survey, we also asked for some general commentary, and here are some of the most interesting remarks we received. Alternative Resins and Ligands: With development of high-capacity cation exchange (CEX) resins capturing ≥100 mg IgG per milliliter of resin, it has become more attractive to implement CEX as a capture alternative to protein A. I led a group demonstrating how a high-capacity CEX capture step could deliver MAb of the same purity and quality of protein A produced material (42). Although CEX could require more development work than protein A for each antibody, the benefits of high capacity and significant cost savings make a strong case for its implementation in some manufacturing processes. Finally, what are the alternative ligands to protein A? Among bioaffinity ligands are some other naturally occurring immunoglobulin-binding proteins such as protein G and protein L. But both suffer the same shortcomings as protein A in terms of low capacity and harsh elution conditions. Camelid mammals produce IgG analogs made up of only heavy chains: VHH single-variable heavy-chain fragments from camels and llamas. The molecules are relatively small in size and very stable. Dutch company BAC BV (now part of Life Technologies) has cloned and expressed them in yeast. The ligands offer high selectivity and show good stability in 0.1N NaOH, both free in solution and immobilized on agarose (43). Because of their small size, they can penetrate deeply into particles. But their capacity may be limited because they are monomeric and thus cannot bind multiple IgG molecules on a single VHH fragment. Synthetic ligands target the Fc region of IgG antibodies by mimicking an epitope (mimetic ligands) or by nonmimetic targeting of the paratope. But these ligands generally lack the selectivity of protein A and show some degree of nonspecific adsorption. Examples include amines, thiophilic compounds, mixed-mode adsorbents, and peptide and chemical libraries. Instead of trying to find a highly specific ligand to an antibody, users could modify it and add a tag. But such tags ultimately need to be removed because the FDA considers them to be impurities. But if you insert a protease cleavage site to remove a tag, for example, that raises concerns regarding nonspecific proteolysis. Some novel systems simplify the cleavage step with tags derived from protein-splicing elements (inteins). But all of these strategies are more applicable to a research and development (R&D) setting than to a manufacturing environment. Reviews in 2007 (5, 6) predicted that protein A was here to stay at least for five more years. Some people responding to our 2013 survey (see the “Survey Says” boxes for more detail) still say that it will not be phased out of manufacturing for another five or 10 years. But a number of recent examples have shown that it could be successfully replaced (35, 42). Others apply SMB for continuous manufacturing of proteins, including at least one report involving a monoclonal antibody (40). Those could be early indicators of changes to come — probably sooner than expected — that could very well transform the field of antibody purification. Blanca Lain is a process development consultant at Genocea Biosciences, 100 Acorn Park Drive, Cambridge, MA 02140; 1-617-876-8191 x8213, fax 1-617-876-8192; blanca.lain@genocea.com; www.genocea.com. 1.) Leavy, O. 2010. Therapeutic Antibodies: Past, Present, and Future. Nat. Rev. Immunol. 10:297. 4.) Carter-Franklin, JN. 2007. Fragments of Protein A Eluted During Protein A Affinity Chromatography. J. Chromatogr. A 1163:105-111. 5.) Low, D, R O’Leary, and NS Pujar. 2007. Future of Antibody Purification. J. Chromatog. B 848:S48-S63. 6.) Shukla, AA. 2007. Downstream Processing of Monoclonal Antibodies: Application of Platform Approaches. J. Chromatogr. B 848:S28-S39. 7.) Gagnon, P. 2012. Technology Trends in Antibody Purification. J. Chromatogr. A 1221:57-70. 8.) Sjöquist, J. 1972. Localization of Protein A in the Bacteria. Eur. J. Biochem. 30:190-194. 9.) Langone, JJ. 1982. Protein A of Staphylococcus aureus and Related Immunoglobulin Receptors Produced by Streptococci and Pneumonococci. Adv. Immunol. 32:157-252. 10.) Lofdahl, S. 1983. Gene for Staphylococcal Protein A. Proc. Natl. Acad. Sci. USA 80:697-701. 11.) Guss, B. 1984. Region X, the Cell-Wall-Attachment Part of Staphylococcal Protein A. Eur. J. Biochem. 138:413-420. 12.) Sjöquist, J, B Meloun, and H. Hjelm. 1972. Protein A Isolated from Staphylococcus aureus After Digestion with Lysostaphin. Eur. J. Biochem. 29:572-578. 13.) Lindmark, R, J Movitz, and J. Sjöquist. 1977. Extracellular Protein A from a Methicillin-Resistant Strain of Staphylococcus aureus. Eur. J. Biochem. 74:623-628. 14.) Duggleby, CJ, and SA. Jones. 1983. Cloning and Expression of the Staphylococcus aureus Protein A Gene in Escherichia coli. Nucl. Acids Res. 11:3065-3076. 15.) Hammond, PM. 1990. Recombinant protein A from Escherichia coli JM83. Ann. NY Acad. Sci. 613:863-867. 16.) Cai, S, Y Liu, B Qiang, and Z. Yao. 1992. High-Level Expression of Recombinant Protein A in Escherichia coli. Chin. J. Biotechnol. 8:93-98. 17.) Engel, H, H Mottl, and W. Keck. 1992. A Modified Vector for the Controlled High-Level Overproduction of Staphylococcal Protein A Fusion Proteins in the Periplasm of Escherichia coli. Prot. Expr. Purif. 3:108-113. 18.) Lindmark, R, K Thorén-Tolling, and J. Sjöquist. 1983. Binding of Immunoglobulins to Protein A and Immunoglobulin Levels in Mammalian Sera. J. Immunol. Meth. 62:1-13. 19.) Gouda, H. 1998. NMR Study of the Interaction Between the B Domain of Staphylococcal Protein A and the Fc Portion of Immunoglobulin G. Biochem. 37:129-136. 20.) Follman, DK, and RL. Fahrner. 2004. Factorial Screening of Antibody Purification Processes Using Three Chromatography Steps without Protein A. J. Chromatogr. A 1024:79-85. 21.) Boschetti, E, and A. Jungbauer Ahuja, S. 2000.Chapter 15: Separation of Antibodies By Liquid ChromatographyHandbook of Bioseparations, Academic Press, San Diego:535. 22.) Hahn, R, R Schlegel, and A. Jungbauer. 2003. Comparison of Protein A Affinity Sorbents. J. Chromatogr. B 790:35-51. 23.) Hjelm, H, K Hjelm, and J. Sjöquist. 1972. Protein A from Staphylococcus aureus: Its Isolation By Affinity Chromatography and Its Use As an Immunosorbent for Isolation of Immunoglobulins. FEBS Lett. 28:73-76. 24.) Kronvall, G. 1973. A Surface Component in Group A, C, and G Streptococci with Non-Immune Reactivity for Immunoglobulin G. J. Immunol. 111:1401-1406. 25.) Gagnon, P. 1996.Purification Tools for Monoclonal Antibodies, Validated Biosystems Inc, Tucson. 26.) Becker, H. Dubel, S 2007.Muronomab-CD3 (Orthoclone OKT3)Handbook of Therapeutic Antibodies Volume III: Approved Therapeutics, Wiley-VCH, Weinheim:905-940. 27.) Hahn, R. 2005. Comparison of Protein A Affinity Sorbents II: Mass Transfer Properties. J. Chromatogr. A 1093:98-110. 28.) Hahn, R. 2006. Comparison of Protein A Affinity Sorbents III: Life Time Study. J. Chromatogr. A 1102:224-231. 29.) Ghose, S, B Hubbard, and SM. Cramer. 2007. Binding Capacity Differences for Antibodies and Fc-Fusion Proteins on Protein A Chromatographic Materials. Biotechnol. Bioeng. 96:768-779. 30.) Swinnen, K. 2007. Performance Comparison of Protein A Affinity Resins for the Purification of Monoclonal Antibodies. J. Chromatogr. B 848:97-107. 31.) Thillaivinayagalingam, P. 2012. Revisiting Protein A Chromatography. BioProcess Int. 10:36-39. 32.) Bak, H, and ORT. Thomas. 2007. Evaluation of Commercial Chromatographic Adsorbents for the Direct Capture of Polyclonal Rabbit Antibodies from Clarified Antiserum. J. Chromatogr. B 848:116-130. 33.) Rehm, B, T Thompson, and M. Plassmeyer. 2011. Bioengineered Protein A Polymer Beads for High-Affinity Antibody Purification. BioPharm Int. 24:36-42. 34.) Kuczewski, M. 2010. PEG Precipitation: A Powerful Tool for Monoclonal Antibody Purification. BioPharm Int. 23:20. 35.) Kuczewski, M. 2011. A Single-Use Purification Process for the Production of a Monoclonal Antibody Produced in a PER.C6 Human Cell Line. Biotechnol. J. 6:56-65. 36.) Giese, G.. Polyethylene Glycol Precipitation of Monoclonal Antibodies and the Impact on Column Chromatography. 37.) Asenjo, JA, and BA. Andrews. 2012. Aqueous Two-Phase Systems for Protein Separation: Phase Separation and Applications. J. Chromatogr. A 1238:1-10. 38.) Stevenson, RL. 2013. Second-Generation Expanded Bed Adsorption Scales from Lab to Plant. Am. Lab. Appl. Notes:1-2. 39.) Bisschops, M. 2009. Single-Use, Continuous-Countercurrent, Multicolumn Chromatography. BioProcess Int. 7:S18-S23. 40.) Warikoo, V. 2012. Integrated Continuous Production of Recombinant Therapeutic Proteins. Biotechnol. Bioeng. 109:3018-3029. 41.) Shinkaz, O. 2011. Countercurrent Tangential Chromatography for Large-Scale Protein Purification. Biotechnol. Bioeng. 108:582-591. 42.) Lain, B, MA Cacciuttolo, and G. Zarbis-Papastoitsis. 2009. Development of a High-Capacity MAb Capture Step Based on Cation-Exchange Chromatography. BioProcess Int. 7:26-34. 43.) Liu, J. 2009. Comparison of Camelid Antibody Ligand to Protein A for Monoclonal Antibody Purification: A Suitable Alternative to Protein A Chromatography. BioPharm Int. 22:35.